With these smart water gadgets and apps, it's easier than ever to drink those 8 glasses a day. 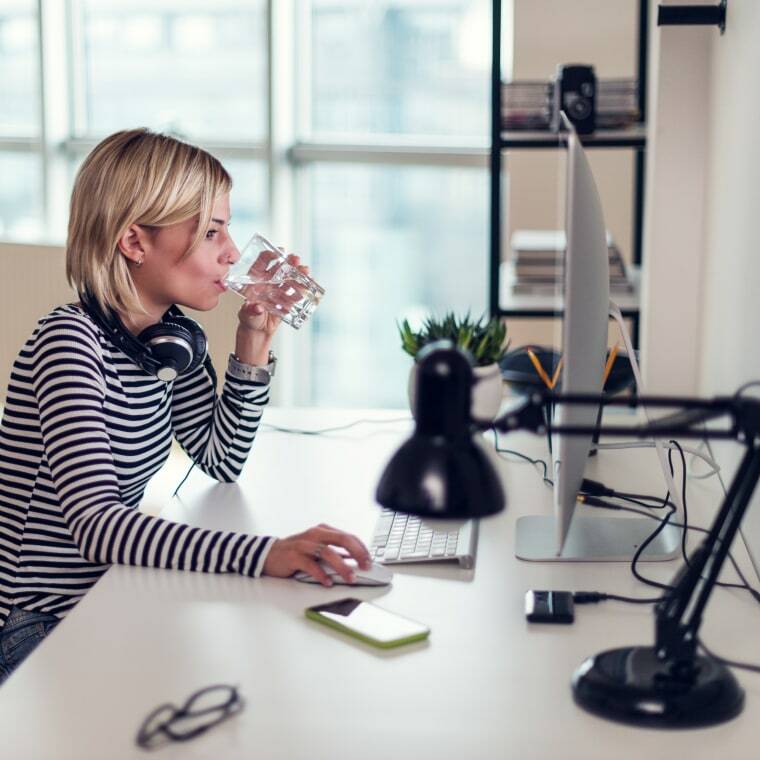 At some point, most of us have had “drink more water” on our to-do list. But most of us also know that increasing your daily water intake is easier said than done. You fill up a bottle when you get into the office, and then run to your morning meeting. Four hours later it still sits there, barely touched, on the edge of your desk. Our first plan of attack? Make it less boring. We’ve never forgotten an iced latte or glass of lemonade on our desk, just sayin’. By infusing water with fruit, veggies and herbs like mint and rosemary you’ll have a beverage your taste buds actually enjoy, making it more likely you’ll sip throughout the day. The second step: invest in some items that will make the whole thing a no-brainer, like drinking water reminder apps, smart water bottles and more. By taking advantage of smart product designed to help you get your recommended water intake, you’ll keep your goal front of mind and sip more throughout the day (instead of trying to guzzle all 64 ounces when you get home at night), without having to add yet another thing to your mental to-do list. Here are some of the best water bottles and smart products to keep you hydrated. This isn’t your standard bottle of water. Smart Technology tracks your water intake and syncs with your smartphone — sending notifications that remind you to drink throughout the day. The companion app also helps you set specific hydration goals and tracks your progress over time, so you can see how you're measuring up to that goal of guzzling more water. The bottle also has an app for Amazon’s Alexa, so you can easily add that extra glass to your tally without even lifting a finger. (The app also works without the bottle if you want to give tracking your intake a try before making the investment). Another water bottle worth having in the cabinet, the Savvy Infusion has an infuser to hold sliced fruit, veggies and herbs for all-natural (and sugar-free) flavor. Suddenly the beverage known for being the most boring gets a little more interesting — and the bottle solves the issue of sucking up pulp and herbs while you sip. Plus, making your own flavored water at home is a money saver. A smarter choice for your health and your bank account. Another way to keep water interesting? Go bubbly. Unfortunately buying packs of seltzer can be pricey (not to mention a pain to lug up the stairs to your apartment). Luckily for you, SodaStream solves both of those problems by enabling you to whip up some carbonated water in your kitchen whenever the craving hits. And the fizzy beverage seems to be effective at aiding hydration: a study conducted by the company found that that SodaStream users consumer 43 percent more water than non-users. Plus, it’s lightweight and wireless — which means we’ll be bringing it out on our patio this summer for refreshing sparkling water (or a bubbly cocktail mixer) made to order. Sometimes we’re sipping our water bottle on the go, other times we prefer a nice glass of ice water at home. Plus, don’t forget that other beverages like coffee and tea count towards your daily fluid intake. Enter Ulla. The tracker that you can place on any bottle, cup or to-go mug so that you get credit for every single sip. The tracker knows when you take a drink, and begins to blink after your vehicle of choice sits stagnant for 40 minutes, reminding you to take a sip. If you struggle to make drinking water throughout the day a habit, and are easily sucked into work, meetings and errands, this tracker will help encourage you to hydrate regularly (without having to think about it). Also available onAmazon for $25. Sometimes all it takes to implement a new habit is having it front and center — like that basket of fruit on the counter or setting your gym clothes out the night before. The same can be said for having a big jug of freshly filtered water sitting on your counter or in your fridge, ready to pour into a glass. (Especially when you tiptoe into the kitchen for a midnight snack.) The “smart” pitcher is power activated so it instantly filters a one gallon (or 16 cup) carafe without the painful drip by drip process of your standard water pitchers. Added bonus: it removes 10 times more contaminants, including over 99 percent of lead. The one-gallon dispenser is perfect for the counter, while the half-gallon (8 cup) dispenser fits in the refrigerator door. Many of us fail to have a bottle of water on hand when we need it most — when we’re outside being active on a hot day. But we get it: the last thing anyone wants to do when riding their bike, heading out on a weekend hike or spending the day at the beach is lug around a cumbersome bottle. That’s where the Vapur comes in handy. Dubbed the “anti-bottle,” it’s made of a flexible material that lays flat when it's empty. So once you drink the water, you can fold it up and store it in a pocket or bag without adding any bulk to your load. You can also opt for a detachable hose, perfect for hands-free hydrating during your run or hike. Also available on Bed Bath & Beyond for $10. If you’ve jumped on the fitness tracker bandwagon, we have another way to quantify your health. The LVL is the first tracker that measures your body’s hydration (as well as your activity) in real time, alerting you to how much fluid you need. What we really love is how the tracker connects the dots for you: telling you how you can expect the increase in fluid to improve your physical performance, mood and sleep. We love turning our goals into games. We have weekly step challenges with our friends, use an app to wager money against our health goals and now we’re using our water intake to indulge our green thumb. Whenever you log a glass, the app uses it to water your virtual plant. If you can’t seem to make drinking water a habit for your own health, keeping your adorable windowsill plant alive may be just the motivation you need. It’s always when you're parched and in need of a water fountain that you can’t seem to find one, whether you’re at your local park, catching a baseball game or traveling in an unfamiliar city. Which is why WeTap was designed to help you locate the nearest fountains, crowd-sourced by users, to refill your bottle or take a quick sip when you’re out and about. (Goodbye $4 bottles of water!) You can also share water fountains you stumble across that aren't yet shared on the app, to help other thirsty users stay hydrated.